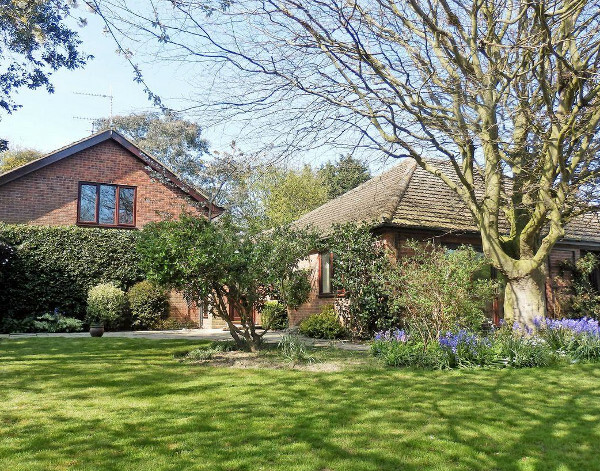 The Beech House in Corton, Suffolk makes a lovely location for a family holiday. The Beech House sleeps 8 people in 4 bedrooms, and comes with a private hot tub, and a swimming pool. And if that isn't enough, the beach is a 5 minute walk. And for those with children in tow, Pleasurewood Hills Theme Park is also a 5 minute walk from The Beech House! The Beech House sleeps 8 people in 2 double bedrooms and 2 twin bedrooms. There are 2 bathrooms at The Beech House. The living room has a large TV, with patio doors leading to the back garden. There is a cinema room at The Beech House too, which has a surround sound cinema system and a DVD player. The kitchen has an electric range, microwave, fridge/freezer and dish washer. With the utility room having a washing machine and tumble dryer. There is also a games room at The Beech House, with a football table, air hockey table and board games. Outside you have a 10 metre x 6 metre outdoor pool, which is open April - October. There is also a hot tub, which can seat 7 people. And a lawned garden with a patio and furniture. There is parking for 3 cars. Holidays at The Beech House start on a Saturday, with short breaks available starting on a Friday or Monday. During your holiday at The Beech House you can easily walk / cycle to one or two places in Corton and Lowestoft. The beach is 5 minutes' walk along a footpath. With Corton having a couple of pubs, which also serve food, and also about a 5 minute walk. Pleasurewood Hills Theme Park is a 5 minute drive; or a 5 minute walk from The Beech House too! There is a large Supermarket (Tesco), which is also - guess what - a 5 minute walk, or a 5 minute car journey. Lowestoft has lots of cycle lanes, most of which are off-road, so you can easily get around town on your bikes. 10 miles up the road is Great Yarmouth, which has a large sandy beach, with all the seaside entertainment you could possibly handle! Or Lowestoft beach is a couple of miles away from The Beech House. Southwold is also worth a visit; this famously genteel town is also home to Adnams brewery. The southern end of the Norfolk Broads start in Oulton Broad, 3 miles from The Beech House, where you can hire a boat and go messing about on the water. Somerleyton Hall and Fritton Lake are another couple of examples of attraction within a short drive of The Beech House. The Old Dairy, Manor farm, Norfolk. This cottage also coasts a hot tub, making an ideal place to spend some relaxing time with your family, friends, or as a couple. Should The Beech House not be to your liking, but you fancy staying in the area around Suffolk, you might well be interested in the cottages below. All these cottages are within a few miles of The Beech House.